Tomato, mozzarella, and basil comprises one of my all-time favorite flavor combinations. It always makes for a reliable panini, is perfect served on its own as an appetizer, and is fun to play around with (as in here, here, and here). Combine this with the fact that I’ve been obsessed with my new cast iron pan (as evidenced here and here) and it was only a matter of time before this frittata came about. Of course, one of the things I so adore about frittatas, like omelets, is their versatility so really and truly you can put anything you have on hand into this baked egg breakfast. Here I’ve added fresh spinach for nutrition and flavor! Interestingly, according to Wikipedia, the word frittata was originally applied to any manner of eggs cooked in a skillet, and eventually it came to mean any sort of omelet-type dish. It’s only in the last 50 years that frittata came to mean what it does to me. The way I do things, a frittata is comprised of a mixture of beaten eggs and any combination of fillings (vegetables, cheeses, and/or meats) that is then cooked over low heat on the stovetop before being finished in the oven. This means that an oven-proof skillet is crucial to this endeavor, and my weapon of choice here is cast iron. I also happen to be of the opinion that eggs are very good for you – high in protein and have been shown to reduce the risk of certain types of cancer. Even better, people who eat eggs for breakfast (in combination with a fairly healthy diet and some exercise, of course) are more likely to lose weight. They’re great after a workout because your muscles will happily absorb the protein. I could go on and on! Obviously don’t live on eggs alone, and everything in moderation. Which is why I used mostly egg whites and only 4 yolks in this frittata. You would never guess that it was somewhat “skinny” since it’s packed with flavor and has a wonderful, fluffy texture. This frittata is so easy to put together and is great hot or cold, for breakfast, lunch or dinner! Serve with potatoes, a green salad, or any vegetable on the side for a full, healthy meal. Heat the oil in a medium cast iron pan or oven-proof skillet over medium heat. Add the onions and cook for 5 minutes, stirring often, until softened. Add the spinach and cook until just wilted, about 2 minutes. Scatter the tomatoes, mozzarella, and basil on top (they should sink slightly). Lower the heat slightly and cook until mostly set, about 5 minutes. Transfer to the oven and bake 5 to 10 minutes (ovens vary so much! It took me 9 minutes), until fully set and cooked through. Gluten free, Kosher dairy, and Vegetarian Want to make it parve? Omit the cheese! This is my absolute favorite frittata combination. Love! What a fresh and delicious frittata. I am always looking for ways to incorporate the caprese flavors into other dishes, so I will definitely be giving this a try….thank you! Oh, my … I love a good frittata … and this looks to be exceptional! I also love the flavors in a classic Caprese salad … what a great way to add them to another dish! Thanks for another great recipe! At first I thought the tomatoes were the egg yolks- the most orange yolks I’d ever seen! 🙂 The frittata looks perfect and delicious! It’s like a caprese frittata – so good! I’m also a believer that eggs are good for you so there is no hesitation in this house to having eggs. Can’t wait to start going through all of the wonderful egg recipes! Thanks for hosting! 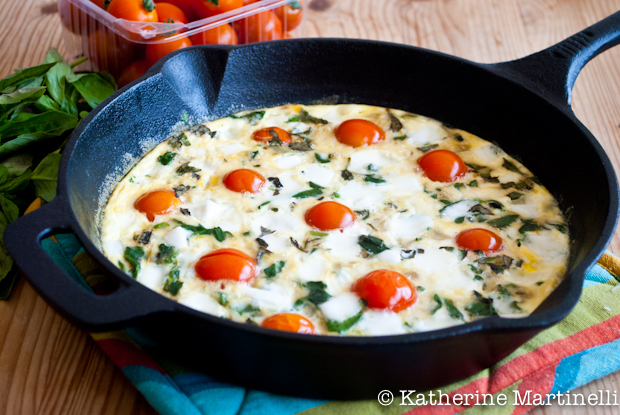 Frittata is a food that you can easily play around with and create unique flavors such as this one Katherine! I ADORE frittatas. Yours is beautiful! Thank you for once again hosting this blog hop! I love frittata and thanks for sharing this delicious recipe! I look forward to the weekend so that we can have nice warm breakfast with frittata. Your recipe sounds really good and can’t wait to try this! 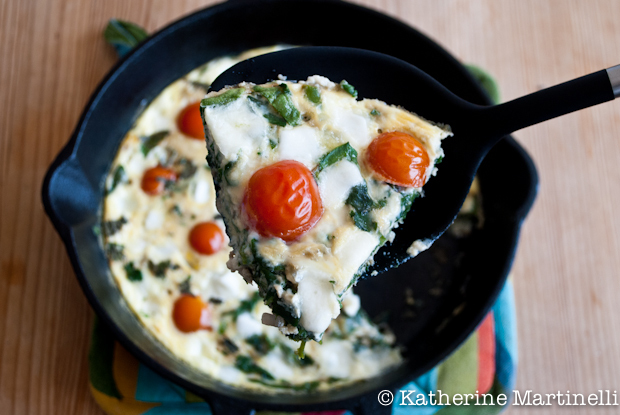 Your frittata looks fantastic…and look at all the fabulous links this week!!!! I love a good frittata and this one looks amazing! Yum! It looks delicious! I usually make my frittate the “old” way, which is on the stove. I cook them on a slow flame and when the eggs are thick enough, I just flip them over and cook the other side. As I am not as skilled as my mum, I make smaller ones: that makes it easy to flip them over! But I doubt it would work with mozzarella as that may stick. 🙂 The combo you chose is hard to beat for anything, it is one of my all time favourite (and the colours of the Italian flag)! 🙂 Happy weekend! I remember being newly married, unable to even boil water and putting a mix like that in the pan. Obviously it needed heat from the top, so I stuck it under a medium griller and it worked! Still make my ‘frittatas’ that way 🙂 ! This is a lovely recipe and I must try it in the oven!! Oh, accidentally found a TITANIUM ovenproof frying pan on line a couple of weeks ago at a huge discount. The most wonderful one I have ever had! Foolproof and practically cleans itself! What a gorgeous and creative ‘Caprese’ like frittatta! Your photos should be on the cover of magazines, daily! Your frittata looks amazing! Thanks for hosting another awesome blog hop! So glad to have found your wonderful site through The Foodie Physician! I am a huge egg fan so was thrilled to see all these lovely recipes and to share a few of my own! Will provide a link on my Facebook page, too. Thank you for hosting! Honestly thats the best looking frittata I’ve ever seen! The frittata is such a great dish! And you can use almost anything in one, and it works well. I like mine with a touch of Parmesan and red pepper flakes, please. 😉 Love the cast iron pan – aren’t they so cool? I’m lucky in that we have two that belonged to my wife’s grandmother – they’re easily 100 years old, and going strong. i like frittata, simple dish and always taste delicious 🙂 i admire your pictures! they are AMAZING! What a lovely and delicious looking frittata! I love frittatas! My husband gave me a fancy frittata pan for Valentines Day and I’ve been making all kinds of frittatas with it. Definitely trying this!! Love your blog hop too! Would love to join but don’t think I can make something fast enough since we’re traveling tomorrow. But I’ll try! That is a beautiful Frittata! I am with you – mozzarella, basil and tomatoes are one of my favorite combos. I love this idea of making it into a Frittata. Love this and love the versatility! Hmmm….I need to get around to making a fritatta and these classic flavors might get me to do so. Congratulations on making the foodbuzz Top 9! What a great frittata! So pretty! 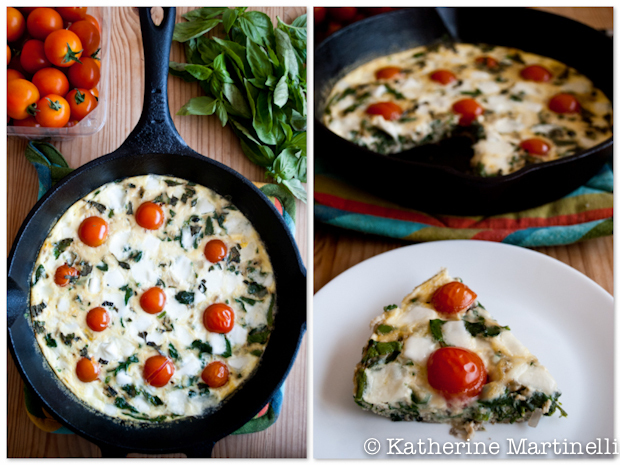 Delicious looking frittata & gorgeous photos!! Love this! I definitely need some inspiration for all the tomatoes currently ripening in my garden! I love frittata, this ones seems perfect for summer. The tomato, basil mozzarella trio is a classic for a reason, it’s exceptionally good and this frittata is a perfect example. I’m quite fond of just about anything caprese myself! But I especially love it with eggs because it’s such a simple way to make them really elegant and flavorful.